Riya is a content creator and doesn’t know how to present ample of information in a simple manner. Her fellow colleague suggested to just write down for the readers. She thought it can be boring and complex to read. A friend explained to her to use Infographics – i.e to summarize the complex information into an easy and comprehensive way using graphics. In simple words, a visual representation of information and an excellent tool to share complex content in a simple image-based format with your audience. Unlike images which are used in conjunction with the text, infographics are self- contained visuals that convey the information. Infographics help to present any type of information – data statistics, findings or long posts in a lucid, concise and easy-to-read format. It is a well-known fact that human brain processes visuals 60,000x faster than text. Hence, it is a preferred option for the marketers as it draws audience attention to simple yet conceptual infographics. As per the Unbounce data, in just 2 years the search of Infographics has manifolded by over 800%. It also states that publishers who use infographics grow in traffic an average of 12% more than who don’t. Generate leads for your business and build brand awareness. Get shares which will help you to reach and engage a wider audience. Infographics are ranked for keywords allowing you to use difficult search ranking words in your content. 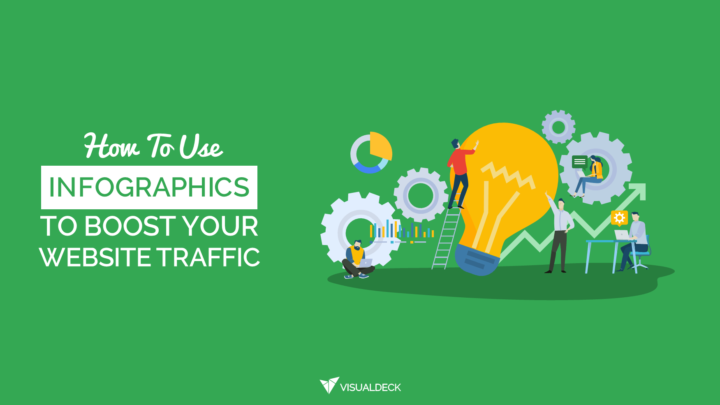 In order to reap the benefits of infographics, a well-planned strategy and useful content is needed to get your target audience to see it and take action. Choose the right topic- evergreen, trending or most viewed content to make an infographic. Based on your topic and content, select the visual layout and design.While creating your own infographics consider these elements to make it effective and shareable on your social media networks to boost audience engagement. Choose the form of infographic suitable for your business and audience that enhances your message -Graphs, charts or sequential data. Use lines, Borders, shapes, and Frames to present the content in an organized way as readers will find easy to interpret it. Use one contrasting color that highlights important information and support other information in the background. Font and style should be complimentary. Create an engaging infographic using a story with characters as it proves to be effective to connect with the emotions of the audience. Include the headline that matches your business and target audience. Infographics should have a balance of visual and text content. Using verified statistical data tells your readers that you are not the only one who believes in it but even the industry experts agree. Present information that is fact-based. Give the audience an insight into the topic which they are looking for. Promote on various social media platforms and existing followers. Use Quora threads related to your topic or business with high traffic and respond with a helpful answer that includes a link to your infographic. Create a board on Pinterest for your infographic and be shared on other popular boards. Make it embeddable as it is easy for bloggers to embed source version on their site. Use Buzzsumo to reach out to influencers share content similar to your infographic topic. Let them know about your new visual creation on the topic and it is likely that they will share it. Use Quuu Promote to promote your infographics to influencers on social media. Reach out to cited sources (if any) and tell them that you have featured them and ask them to share further in their niche. There are seven major types of infographics to present your information. Reading dates in chronological order can be highly tedious and unexciting. However, giving the information a visual touch can be incredibly interesting. The timeline infographic is appropriate to tell the story of your brand or history of the industry. Whichever template of timeline infographic you use, make sure it is not cluttered and there is a clean space explaining every event in 1-2 lines. Example: The Background behind the bottle, Coca-Cola. The most successful and biggest beverage selling brand Coca-Cola explains through timeline infographic about the history of the product and logo. It is incredibly creative and unique that has a consistent design and includes colors of the brand. As the name of the infographic suggests to prepare a checklist to tell people, step by step about things they need to accomplish or buy. These infographics are easy to make and the ideas mentioned can be put into action. JustWorks has created a new hire checklist for managers to make the new hire’s first day best and comfortable for everyone. A clear and well-designed infographic that helps the audience. How-to infographics are meaningful and actionable. How-to infographics can be specific to a topic or general guidelines – How to start a business. It is instructional and descriptive but in a concise way. Limit the information to appear as a visual blog and keep the structure of the sentences simple explaining each point in 1-2 sentences. Home Depot wants to be the guide color theory using the color wheel to homeowners when painting their home. The infographic helps homeowners exactly what they need and educate them on aspects of color theory, design and what works, and what doesn’t. So thoughtful, isn’t it? When you want to show comparison and contrasting information, products or myth v/s fact, this type infographic helps to enhance the content. It portrays ‘this v/s that’ data in an easy and smooth manner that you can register it quickly. The templates are available and can be customized by updating the text, changing the color and icons to share information with the audience. This infographic is created by a Japanese blogger named Ryoko curated all the information from an article she read on what makes you creative – Coffee or Beer. She turned the information into a readable and shareable infographic which is easier for the human brain to process the data than the entire blog. She also made a ‘Conclusion’ which is clear, short and simple. The visuals or icons, fonts, and colors make it look very appealing and interesting to read further. The comparison between the two products is presented in a creative and entertaining way. This educational infographic highlights the most common and searched topic – Grammar Errors and got over 4000 organic searches. The use of animated characters and visuals are relevant to the content. You can present data precisely by telling your audience what they can benefit from. You can explain to the audience what they can do and not by splitting the data into two. This infographic helps you to build trust by sharing your expertise about a topic or thing. You can use green and red color to show good and bad respectively. Also, visuals help in message retention. A very insightful infographic on the customs and table etiquettes around the world. Keep it simple and do not overfill it with information. Here, the number of tips is limited for each country makes it easy to process and recall. It is not heavy-handed and the visuals make it appealing. A large amount of data, can be presented in a visual way that’s easy to scan. The focus here is to give an interpretation of data in a chart or graph format. This infographic will have more visuals than text and will be divided into sections. Use different icons when designing it. This is a B2B infographic based on IBM’s online retail business revealing the details on consumer shopping trends and tactics brands use to ensure they were prepared to meet customer needs over the holiday. The design is seasonal and creative. They have used signature color and fonts of the brand. The right use of icons tells you what type of information are you looking at. You can use this infographic to convey marketing statistics. If you have a list of information and facts, you can simply distribute it quickly without customization using a simple statistical infographic. If you have data and statistics, it can be presented in the form of a story stating actual facts and figures. If used correctly, Instagram stories can help you brand identity, followers and increase sales. This infographic delivers all the necessary facts and stats using compelling visuals. A creative and engaging infographic can increase your website traffic. It is time to implement the ideas to know the result for yourself. You can reach out to the excellent team of Visual Deck to get your infographics done the right way! Try us out with a 14-day risk-free trial! Neha is a content writer at Visual Deck who writes on the topics related to Content Creation and Marketing. Her journey started as a financial professional but she soon realized her passion for writing and is now living her dream as a content writer. She is geeky and friendly. Her goal is to enlighten the audience on various topics through her writing style.